Pens, pencils, hole punchers and the like are the compulsory items for any workstation. However, if you want your office desk to be that little bit more fun, take a look at the wacky objects that we’ve rounded up. It’s colourful and compact, which means that it will stand out amongst the various documents on your desk without taking up much space. 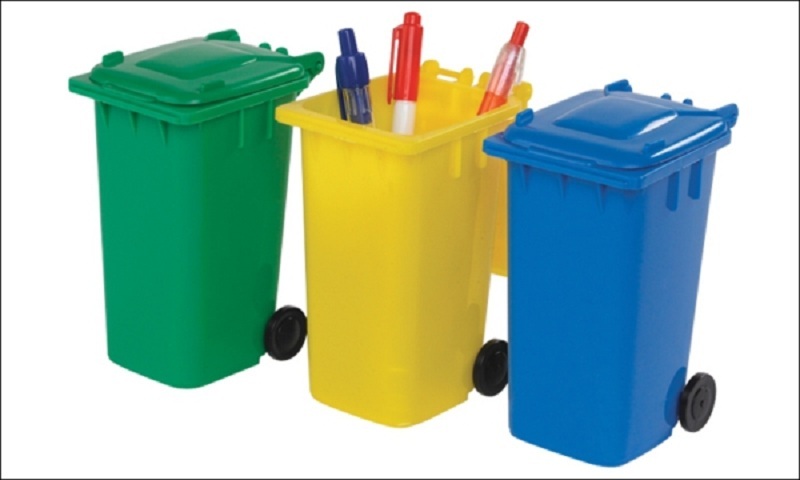 The Wheelie Bin Desk Tidy can be used for storing small stationary or for depositing food waste. Whether you’re the office practical joker or just somebody who’s afraid of their valuable possessions going missing whenever they leave their desk, you can disguise your laptop with this unique sleeve. It can be altered to fit your laptop’s measurements so it doesn’t matter how big or small it is, and the sleeve provides it with a durable lining of PE foam for protection. It’s easy to throw your batteries in the bin, especially when recycling them will cost you time. This handy little tin makes it easier for you – it’s vibrant so you won’t forget about your batteries, like you would when putting them in a draw and telling yourself that you’ll recycle them later. Corkboards help you to remember important information, but they are dull. The Memo Mountain, on the other hand, is not. The colour hasn’t been changed so it will fit in with your surrounding in the same way that ordinary cork does. Plus, there are no adhesives involved, so it can be moved wherever and whenever you want. The Tidy Ruler is very efficient – it’s a ruler and sharpener in one, and it can hold a pencil. This means that it will take up less of your space. It measures just 30cm in length and the pencil mentioned above comes free with it. That’s three bits of stationary covered in one purchase. You shouldn’t blow your nose on it, unless you want to ruin it. With that point firmly aside, the Hankie Pocketbook is a fun way of taking down notes. It is designed to fit in the top pocket of your jacket, so you can store important reminders on the go. It also looks very smart. There’s something about having fish-shaped paperclips that just makes you want to smile. Like all paperclips, Sardine Paperclips are reusable, which is useful because you’ll want to use and re-use them as much as you can.